Yes, Apple had a massive quarter. But just how masive? This chart from Asymco puts Apple’s incredible revenue growth in perspective. Apple grew revenues by 82 percent last quarter, which is unprecedented growth for a company of its size with $28.6 billion in quarterly revenues. As you can see from the chart, nearly all the growth in sales is coming from the iPhone (gray) and the iPad (blue). In fact, 71 percent of Apple’s sales and 78 percent of its profits now come from iOS devices. And the iPad alone is cannibalizing Mac sales. But take a closer look at the chart. What is truly astounding is that for the first time in the last 6 years, second quarter sales peaked higher than holiday sales in the fourth quarter. Every other peak is during the holidays, but the growth of Apple’s new class of touch computing products helped push sales past that to “Super-seasonal performance,” as Horace Dediu puts it on Asymco. We all talk about “blowout” quarters, but there is something truly unprecedented happening here. Apple’s growth is accelerating. 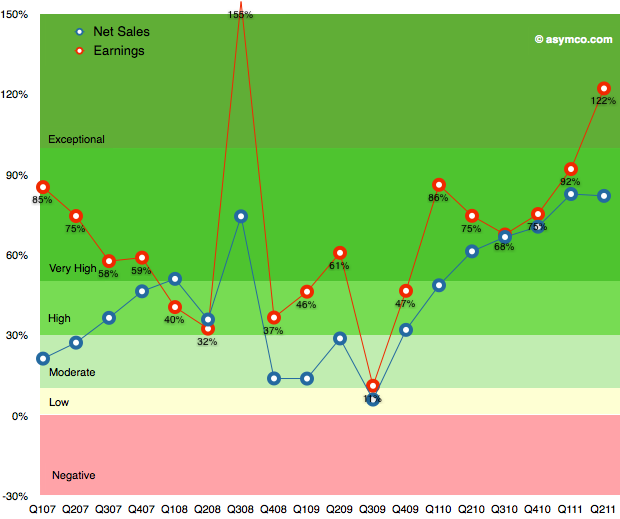 The chart below shows growth rates for both sales and net income shooting upward for the past 7 quarters. While sales grew 82 percent, profits grew even faster at 122 percent. You’d expect to see that kind of growth from a small startup with a few million dollars in profits, not a tech giant with profits of $7.3 billion. Compared to the year before, Apple added $4 billion in profits alone.